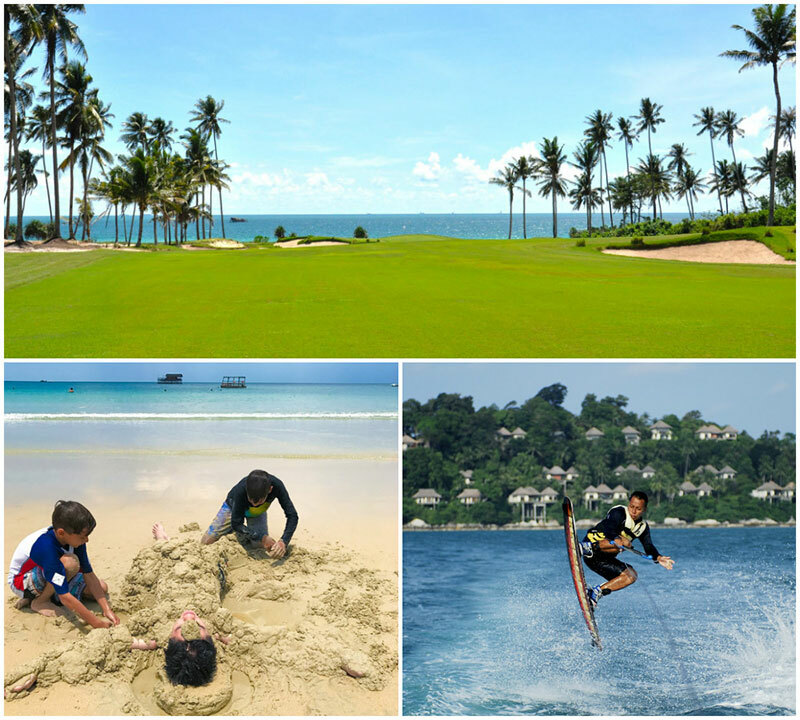 Is it time for that long-awaited family holiday or long weekend getaway with friends to Bintan (again)? 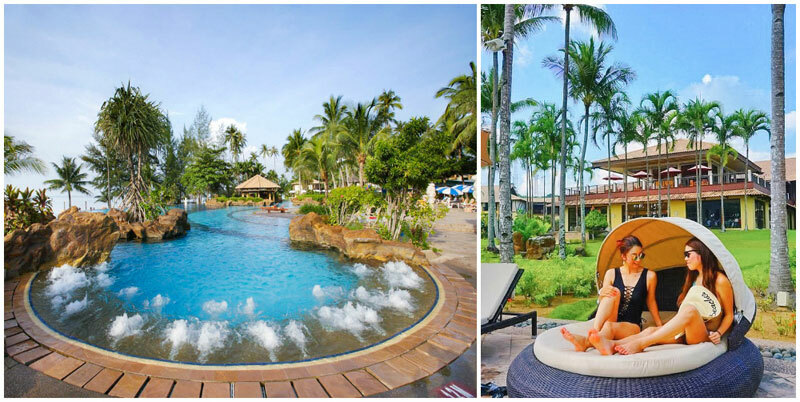 We love Bintan – just a short one-hour ferry ride away from Singapore where you can play in clean sandy beaches, lounge and chill with delicious seafood and relax with affordable massages! How can holidays be so convenient? 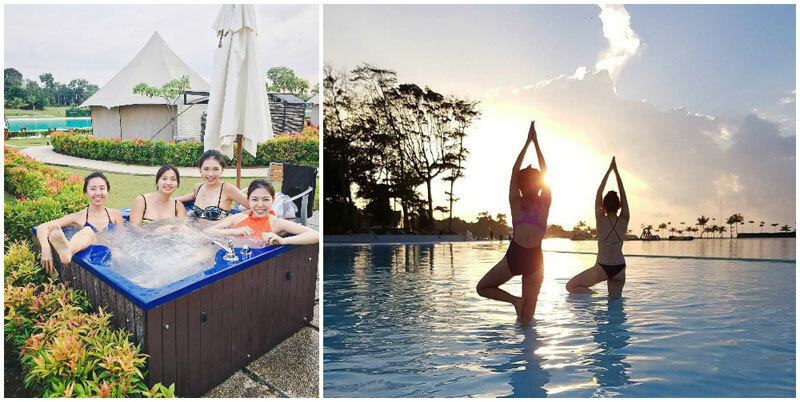 But we all know planning for a family holiday or a vacation for a group of besties is no easy feat – the first thing that comes to mind? Accommodation, of course! After months of toiling, all we look forward to is a luxurious villa or resort where we can spend time chilling, relaxing and catching up with our loved ones – we’re sure most of you will agree with this! Now we’ve got this major (potential) headache solved for you – after hunting around, here’s our recommended picks on the most value-for-money luxurious villas that are right by the beach, and with at least two bedrooms to accommodate the whole gang comfortably. 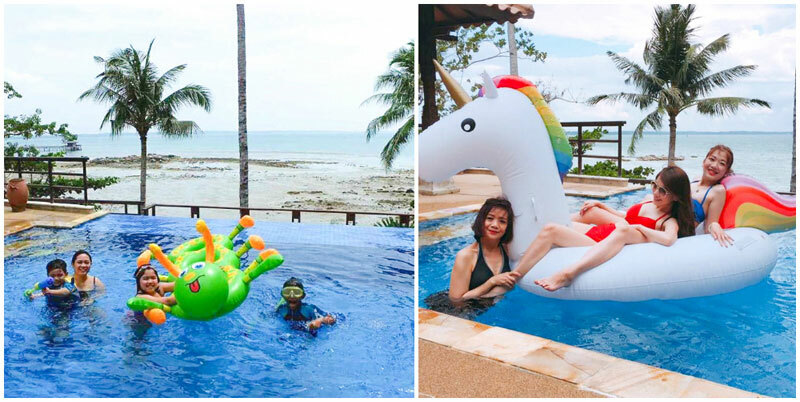 Think private pools, balconies, and an incredible array of fun activities – we’re sure you’ll want to book your group stay immediately! 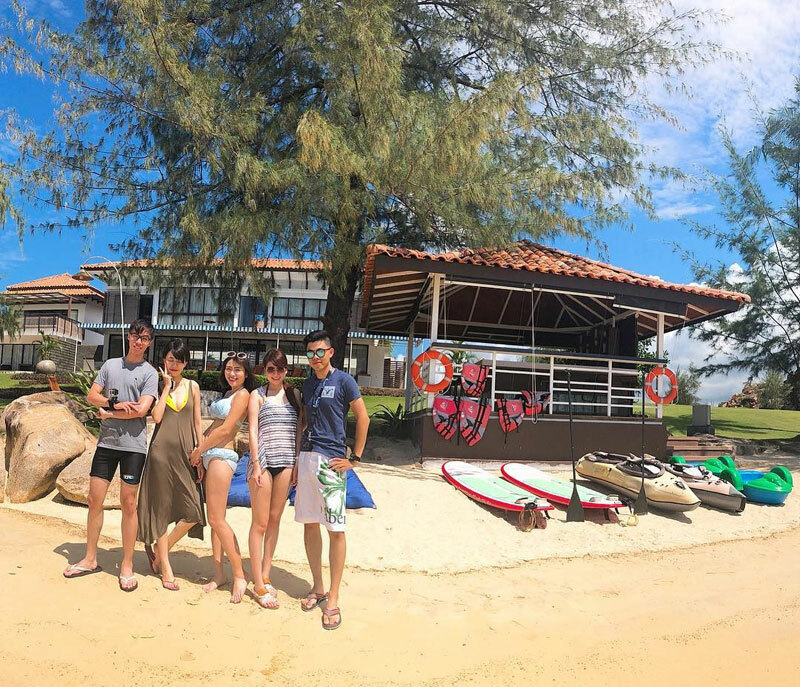 Don’t we all want our family holidays in Bintan to be as convenient as possible, where everything is at your fingertips? 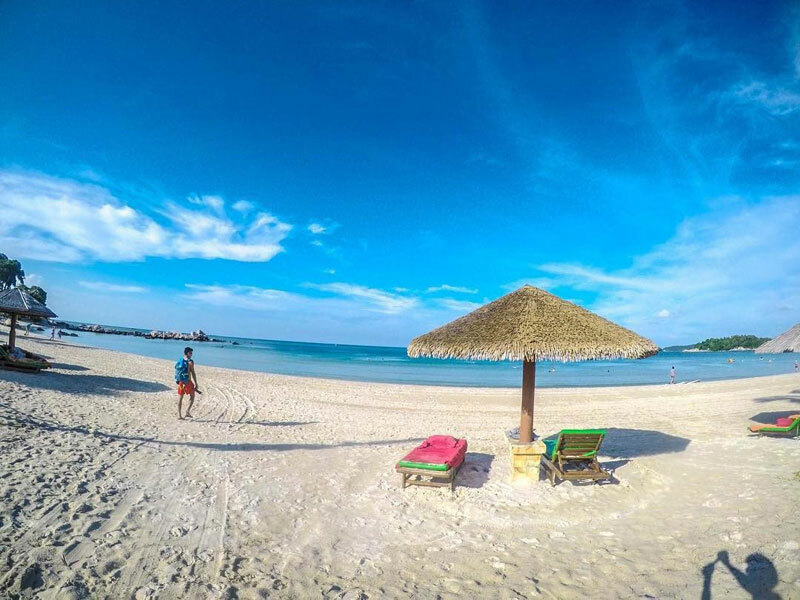 At Bintan Resorts, the spectacular ocean, white sandy shores, a variety of seaside dining options, diverse luxury amenities and a multitude of water and land recreational activities are just steps away from your room! Who says you ever need to venture far to experience everything? 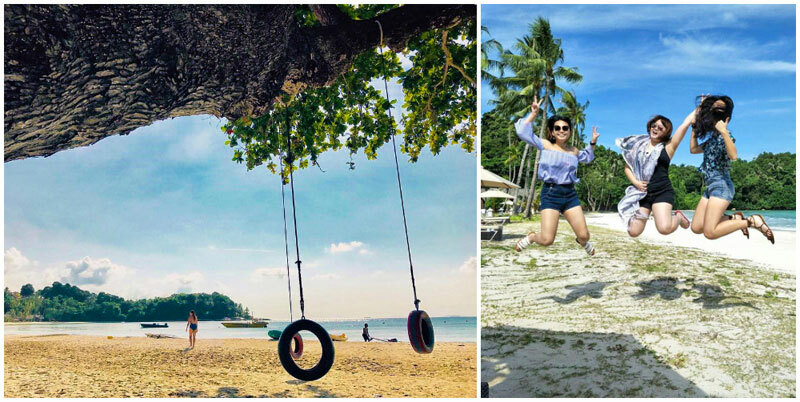 With no more time wasted on excessive travelling, you can make the most out of your hard-earned vacation. Because we know – every single second counts when you’re on holiday! P.S. 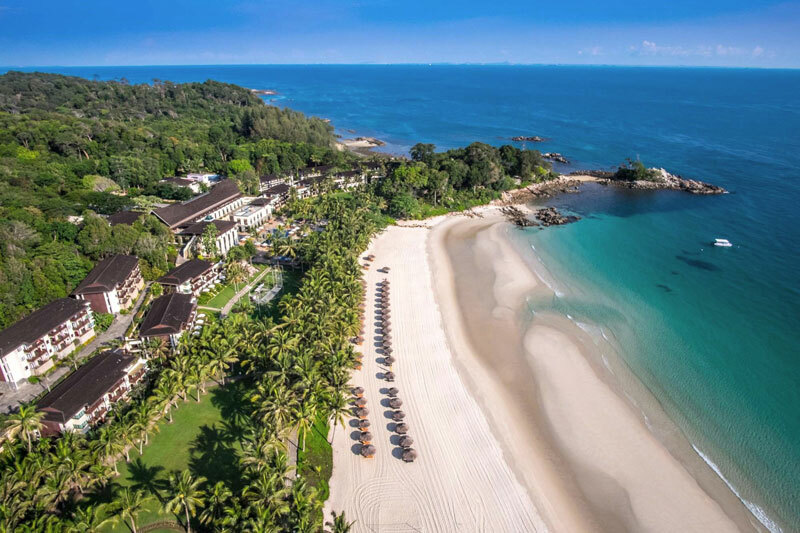 Bintan Resorts is a multi award-winning, integrated tropical beach destination located on the beautiful northern coast of Bintan Island, Indonesia. 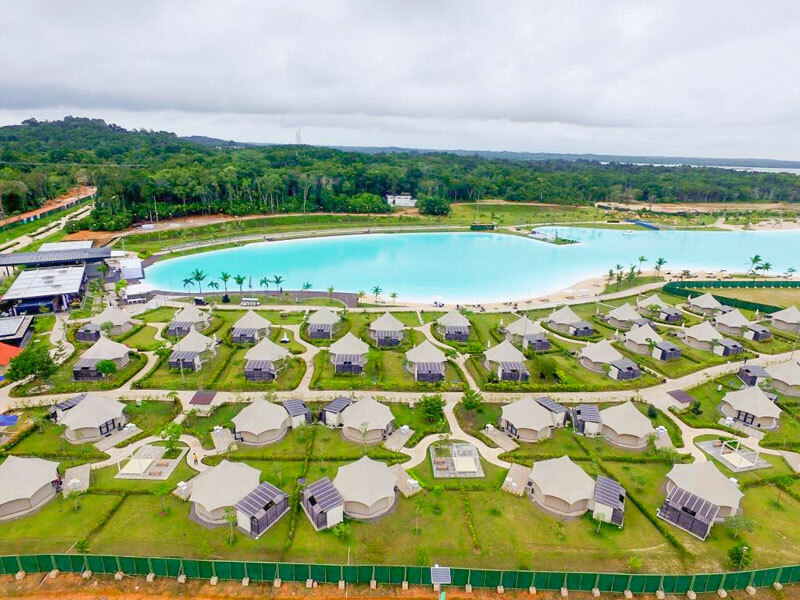 Currently, there are 13 independent beach resorts, 4 designer golf courses, and a range of recreational facilities and attractions located within it. 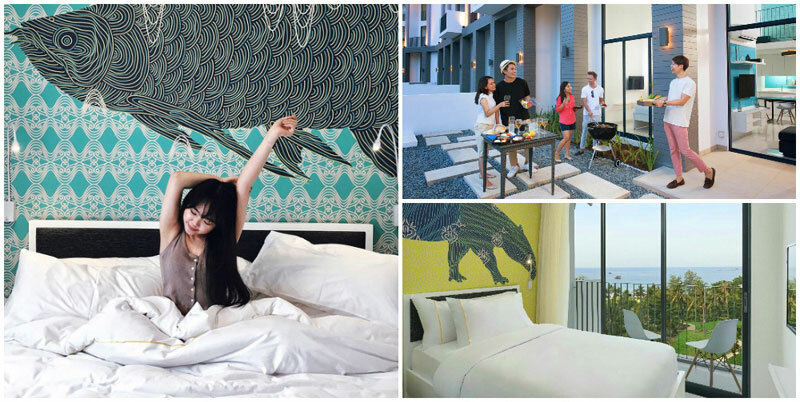 With its fun and funky interiors that create a comfortable energizing vibe, you’ll be happy you booked your stay at the Cassia Bintan (Bintan Resorts’ newest addition)! This unique hotel offers small apartments, and each unit is a suite with a kitchen, with decor as funky as the rest of the condo. 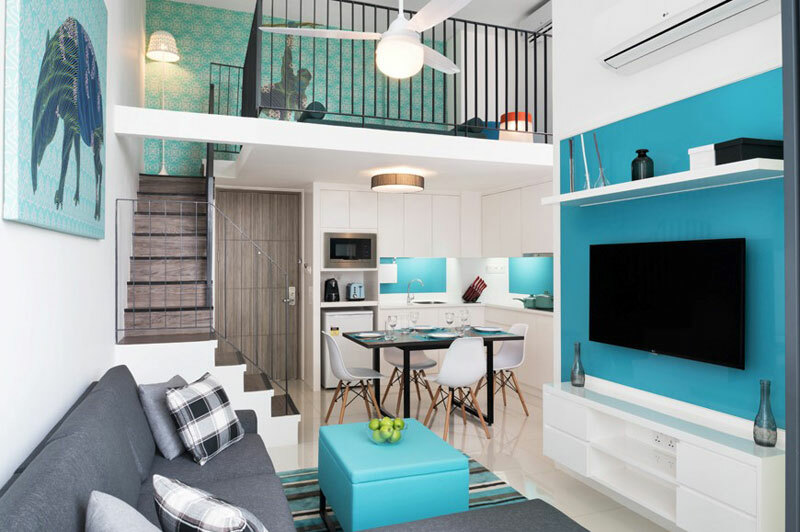 Hues of white and aqua and pale green give this place a swanky-but-casual feel. 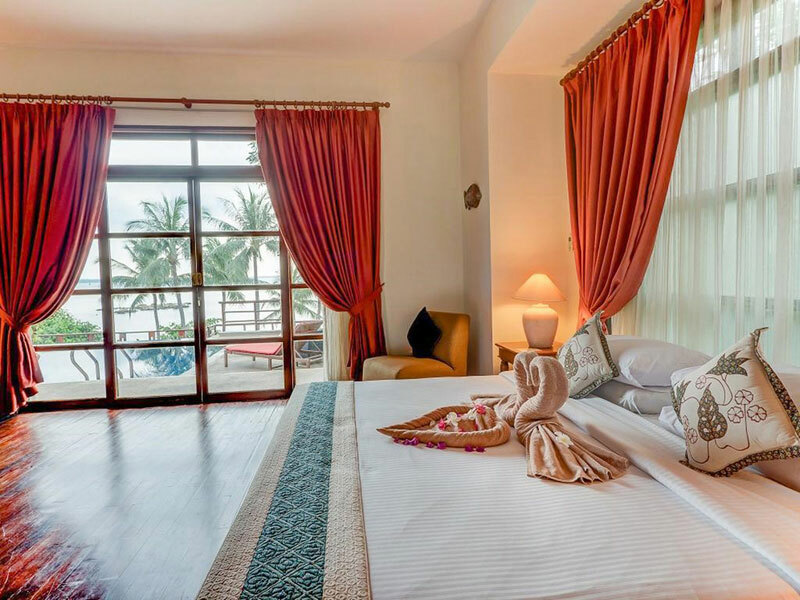 If you’re travelling with friends or family, Cassia Bintan, opt for the two-bedroom villa apartments so everyone can stay together! When it’s time for some evening-chilling, what’s better than refreshing cocktails at the Xana Beach Club while you watch the sun go down? And of course, how can a group holiday be short of fun activities? 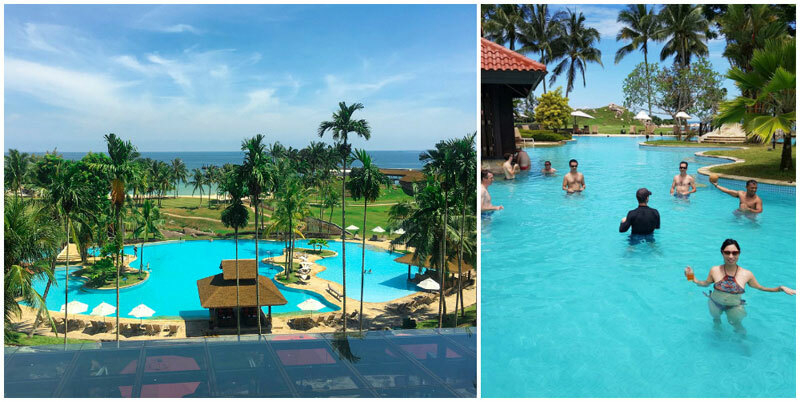 You can check out the golf course (part of Laguna Bintan), or if you’re always drawn to the water, spend the day lounging at the shoreline or dip your toes in the pool! 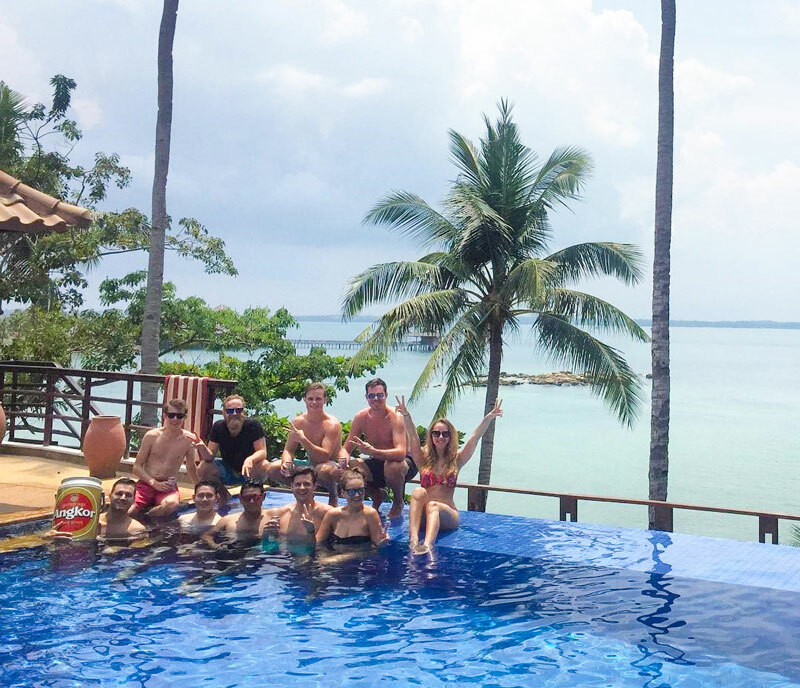 Whether you’re staying as a big family or travelling with your best friends, the Bintan Lagoon Resort can accommodate any group! 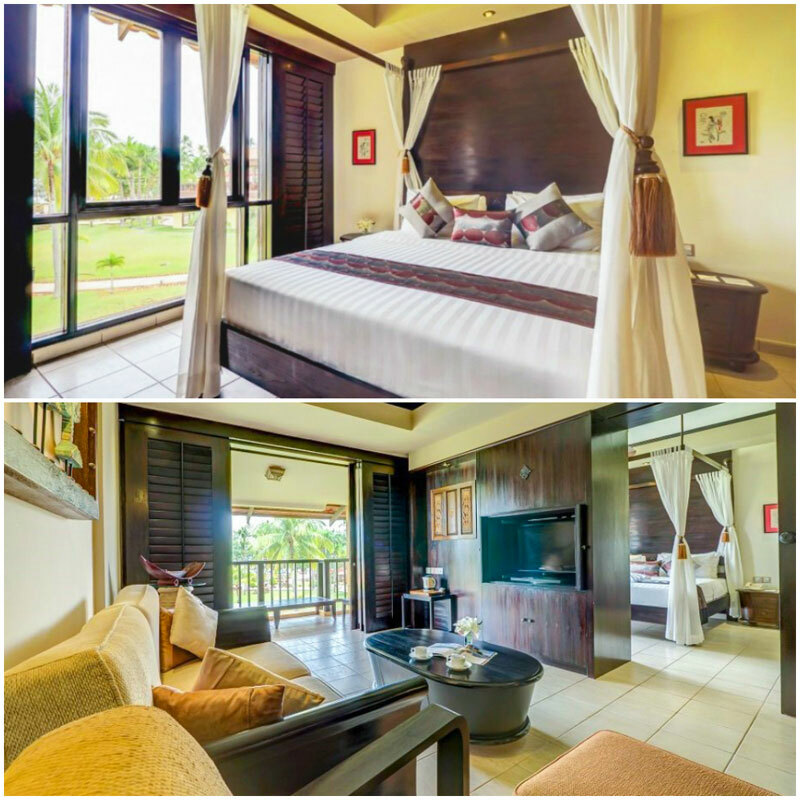 Choose from their selections of 3 or 4-bedroom villas, that can comfortably sleep 4 to 7 guests per villa. 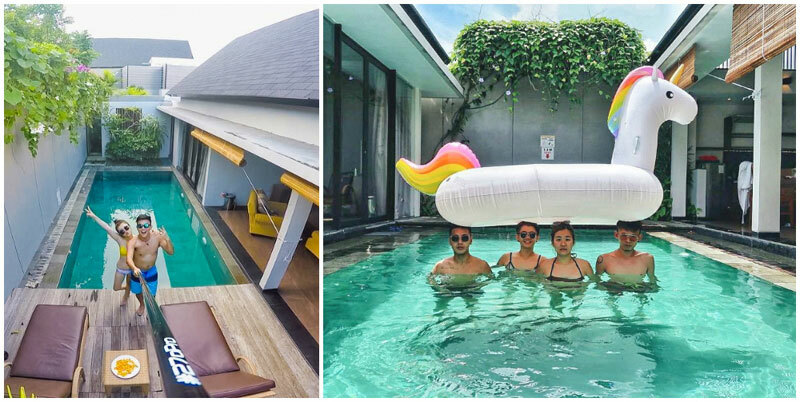 Don’t miss a private getaway in the Cempaka Villa and Buganvil Villa. But for a true luxury experience (at a great value! 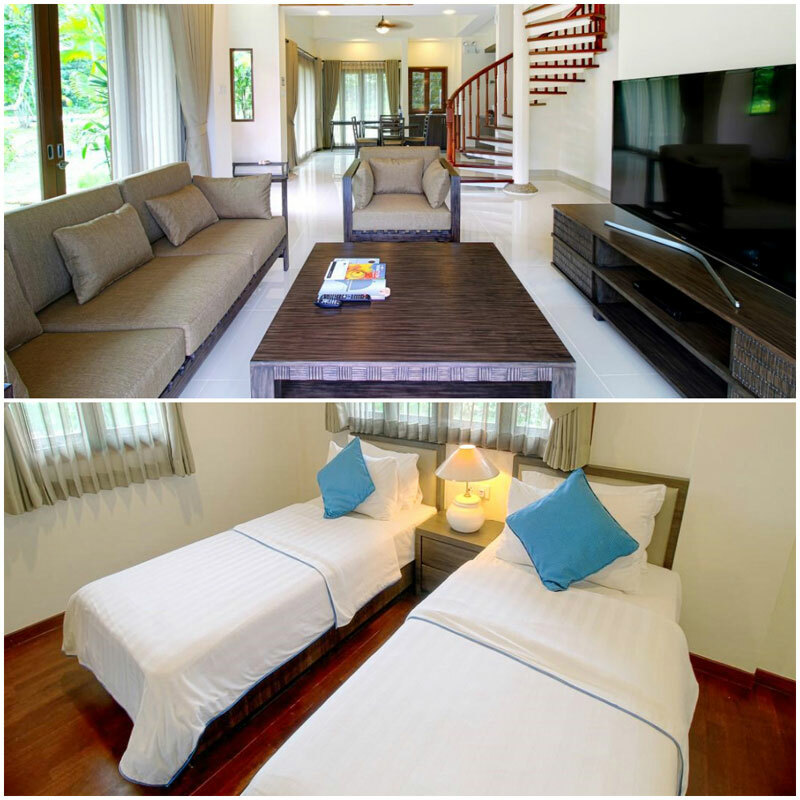 ), you’ll want to book a stay in the Angsoka Villa. 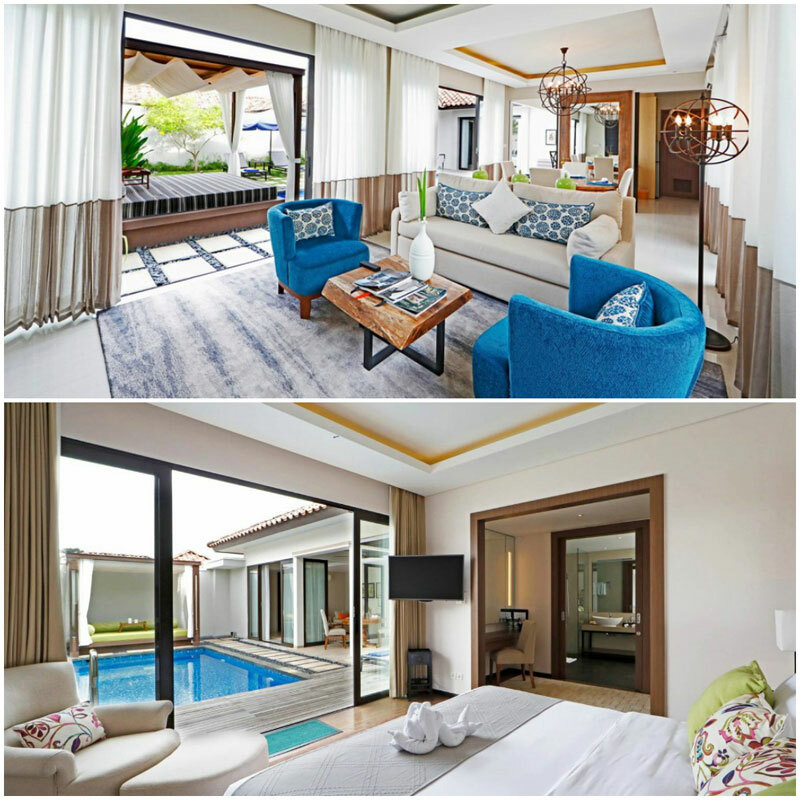 With its warm, inviting interiors, you’ll feel comfortably at home – if, that is, your home had its own private pool like this villa does! 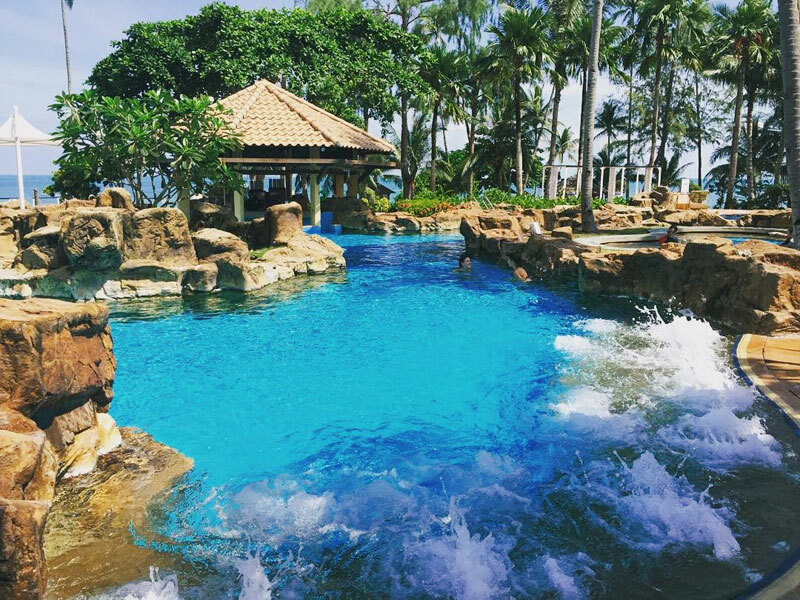 And how can you not splash the day away in the massive oceanfront lagoon pool? 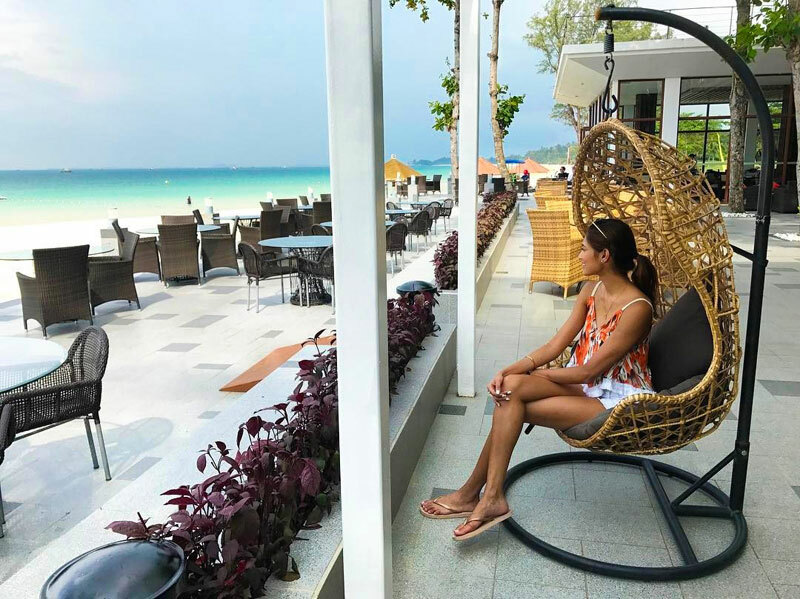 When you’re feeling peckish, don’t miss the resort’s Nelayan restaurant, where you can dine right on the beach with spectacular views of the South China Sea. Sunset cocktails, anyone? 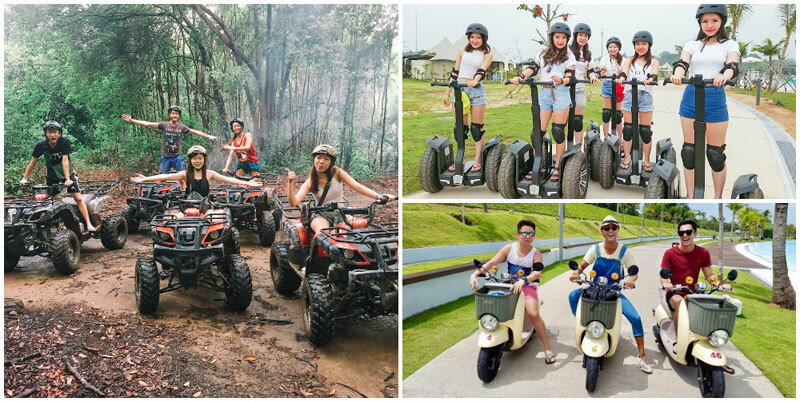 The resort has no shortage of activities either. 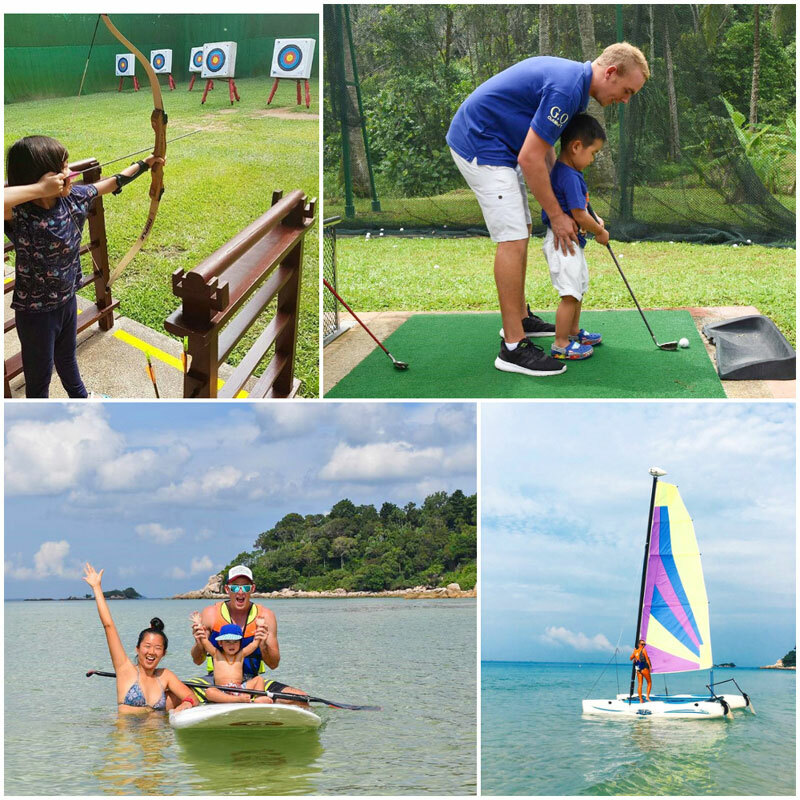 From land activities like ATVs, mini golf, archery, and even Wii and Xbox games, to water activities like jet skiing, kayaking, or snorkeling, there is something for everyone, including the kids. Travelling with little ones in tow? 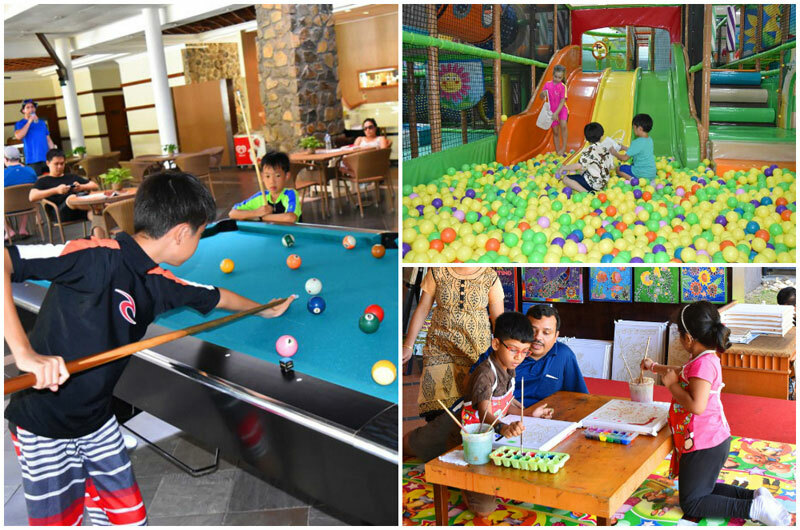 At the resort’s Leisure Centre, they can take part in activities such as painting and crafts – a great way to keep them happy and entertained. Or you can let them loose in the colourful on-site jungle gym! It’s free for mini guests aged 3-10, and has all the best features to keep kids busy and active. Let’s be honest – with all the slides, tubes, nets, bridges and foam obstacles, even adults would want to play in this big indoor playhouse! How about staying right by the ocean with lovely beachfront views from your private balcony? If you love snuggling in the same room as your family and friends for late-night heart-to-heart chats, you’ll love the large family villas with elegant interiors. What can be better than having your own private space where you can spend quality time together? 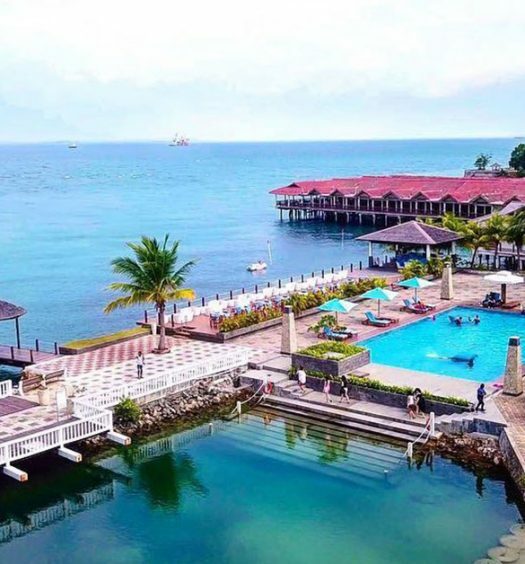 Don’t miss their outdoor Beachfront Restaurant, where you can enjoy fresh seafood with an unparalleled view of the ocean and the scent of the sea breeze in your faces. 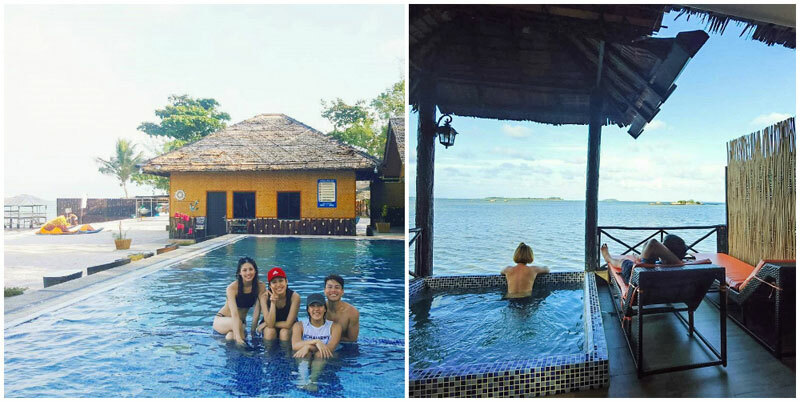 How will you spend your vacation days? 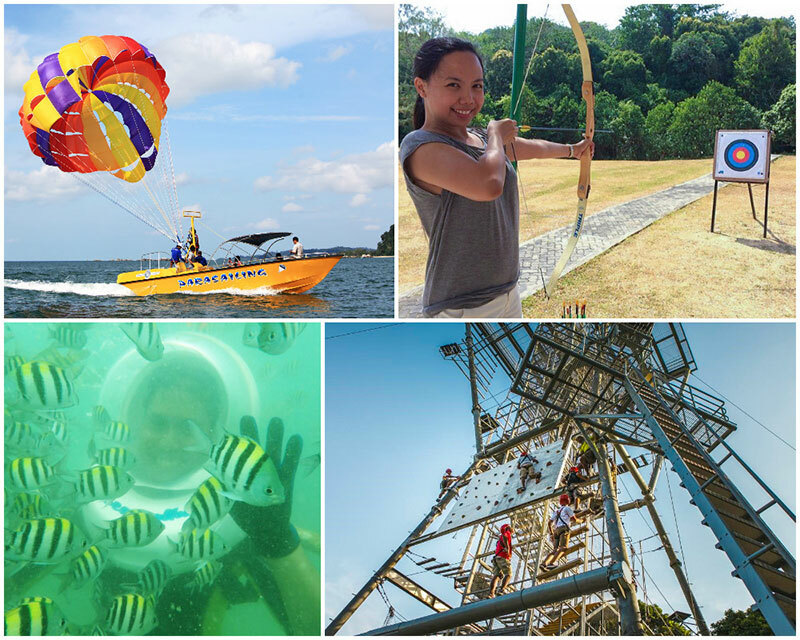 With all the activities offered by the hotel, you can choose almost anything! If you’re an avid outdoor-goer, you’re in luck. 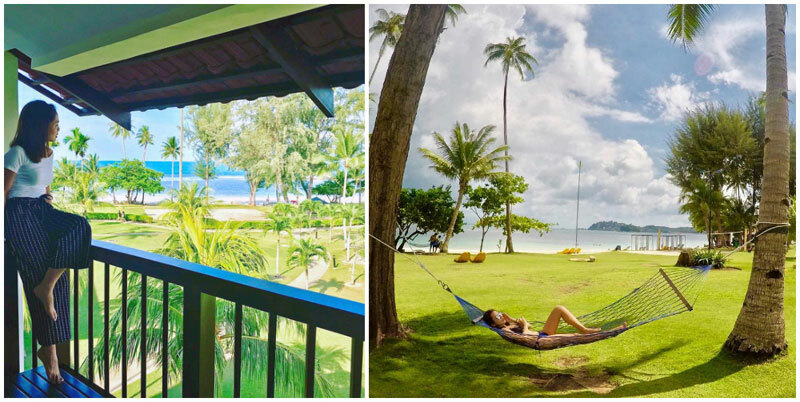 The hotel offers snorkeling, windsurfing, and everything in between – even a visit to a fishing kelong where you can jump onto a hammock right on the ocean! P.S. 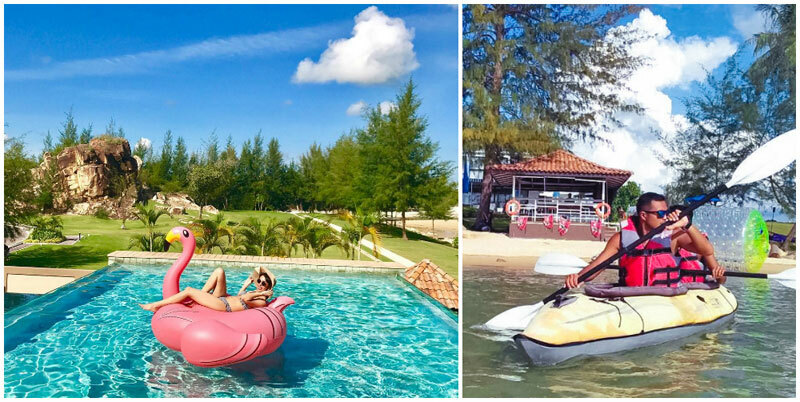 If you are coming as a couple or don’t mind splitting into groups of two, we highly recommend checking out the Jacuzzi Ocean Suite and Royal Pool Villa, where you can enjoy a private jacuzzi or pool right on the ocean! Who says you can’t be spoilt for choices, even by the beach? 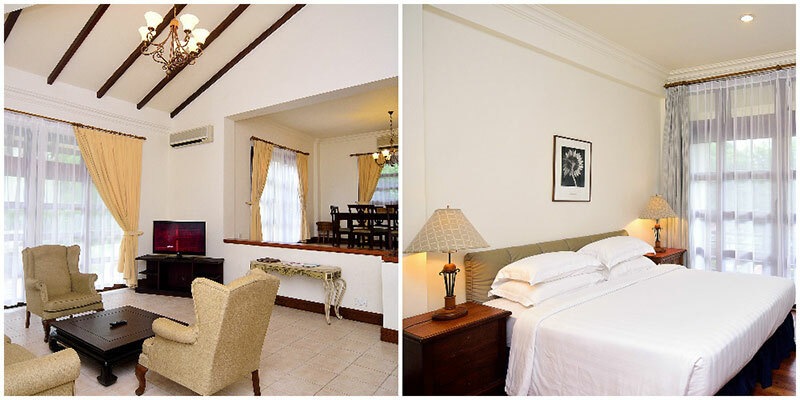 You can find many accommodation options within the compound of Nirwana Gardens. Here’s introducing some properties you will love to check out with your family and friends! 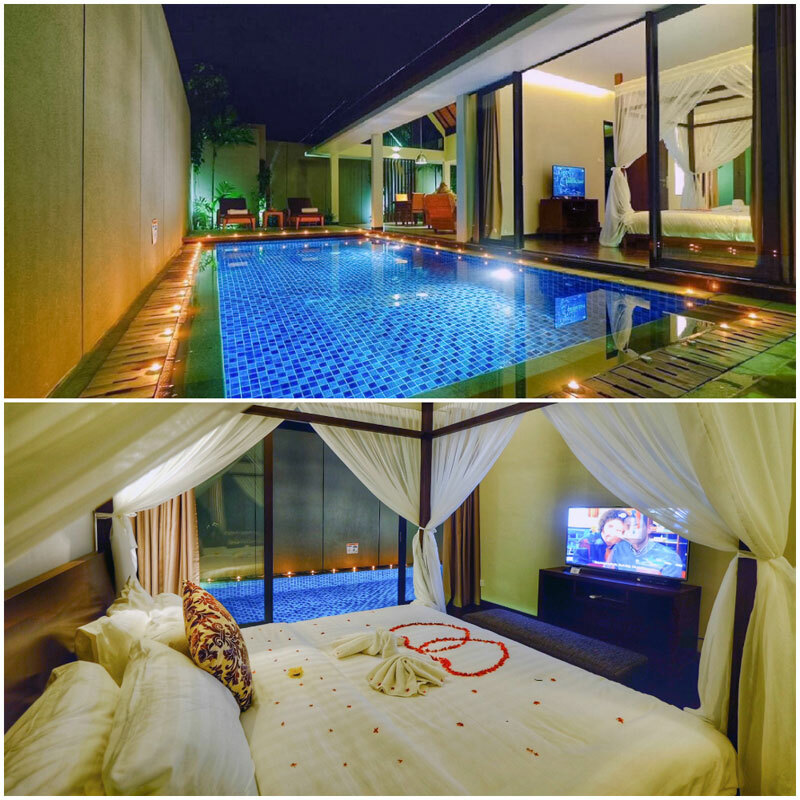 The Indra Maya Pool Villa is definitely not new to spoiling their guests! It includes 8 villas, all exuding an air of complete and utter luxury and paradise. You can even get a complimentary 30-minute massage*! 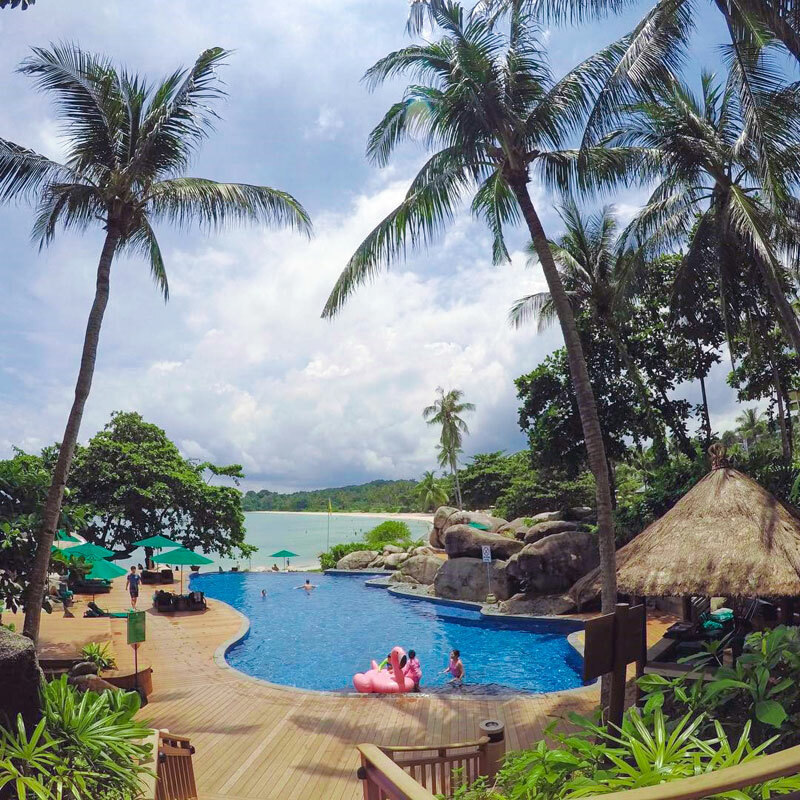 The villas face the South China sea and offer dazzling views of the Bintan coast. Each villa comes with a private pool and maximum privacy as you take in the views and relax with your family and friends. *Subjected to availability of promotions packages. Get ready for a real nirvana! At the Banyu Bira Villa in Nirwana Gardens, each villa is luxuriously double-storeyed, with either 2 or 3 bedrooms to accommodate your family and friends! 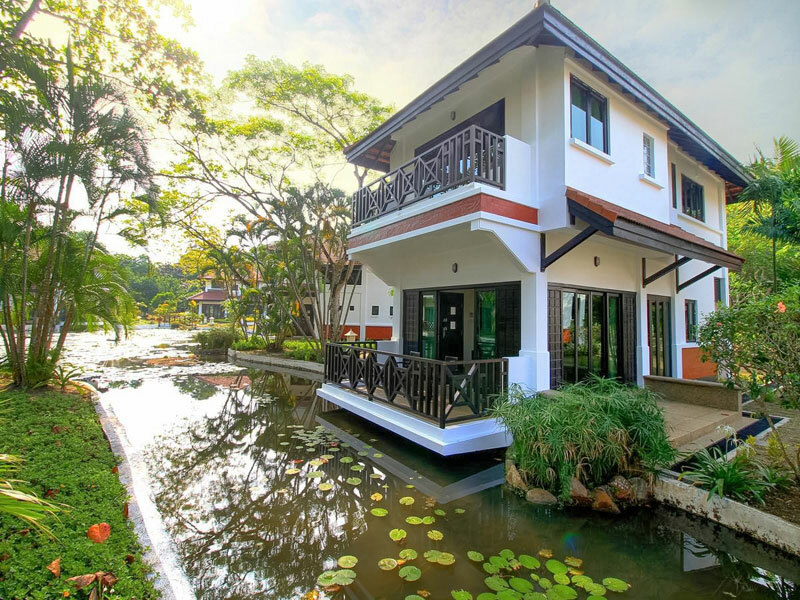 The fish pond that surrounds the outside of the villa will make you feel like you are staying in a tropical jungle oasis. Travelling with your family and friends? 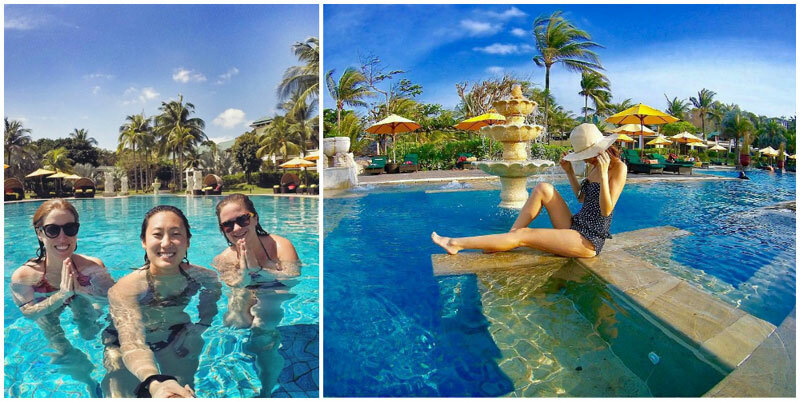 Nirwana Resort Hotel is nothing short of a slice of heaven for you. To accommodate your group, zoom in to the elegant Nirwana Suite and experience the true meaning of luxury. 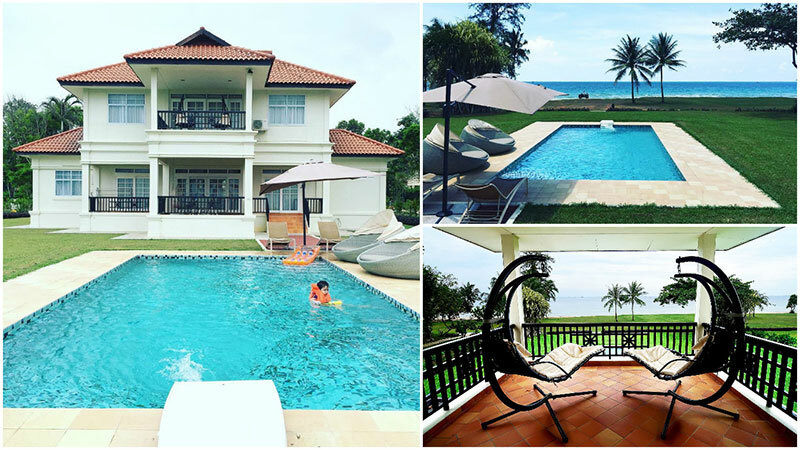 You can easily spend your free time lounging around in the stunning room with sweeping views of the sea, gardens or pool. You can even enjoy lovely views of the ocean from your own balcony! 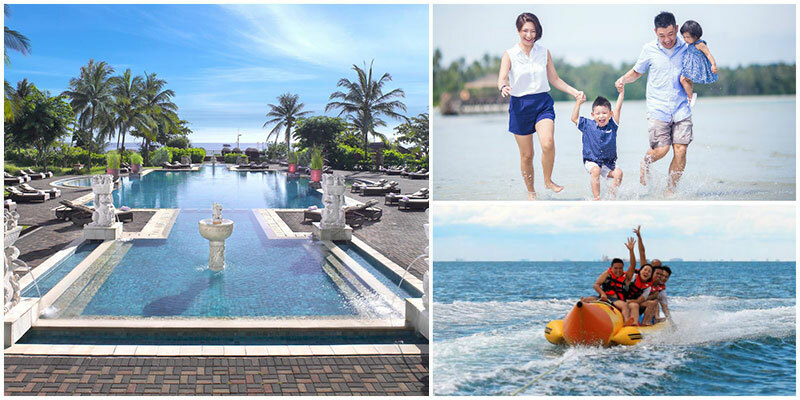 Exciting activities & facilities at Nirwana Gardens: Pool, kids’ club, watersports, spa and more! 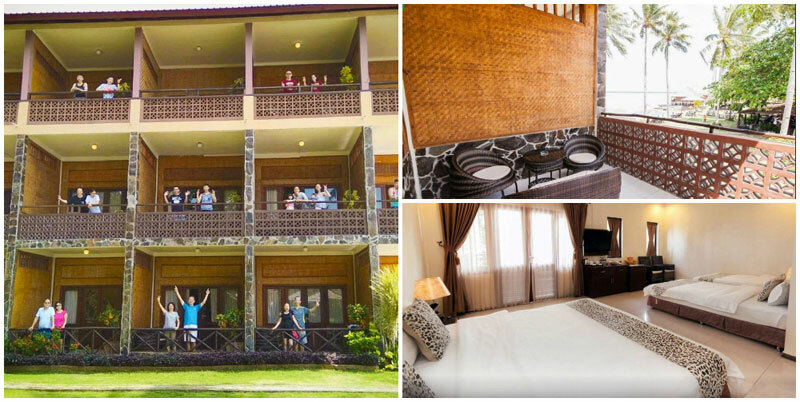 If you are staying at Indra Maya Pool Villa, Banyu Biru Villa, Nirwana Resort Hotel or any other accommodation options within the Nirwana Gardens compound, don’t forget to make full use of the shared facilities in the area! 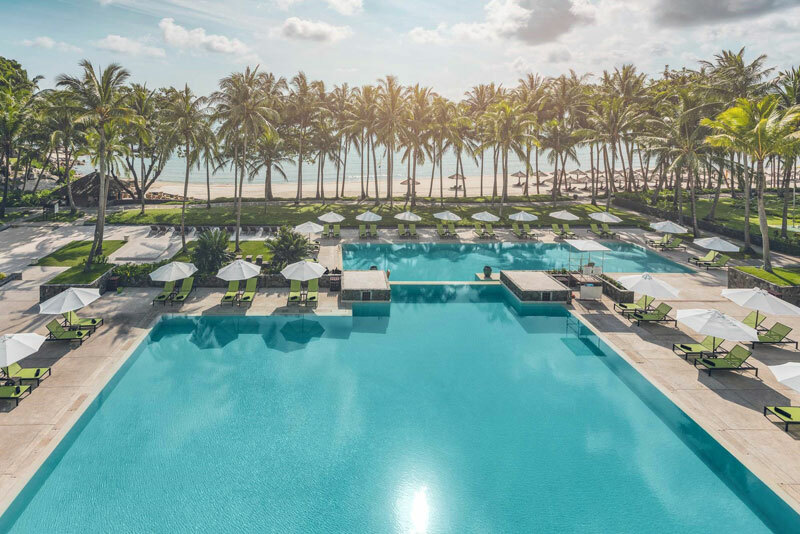 The first thing not to miss would be the oceanfront pool! 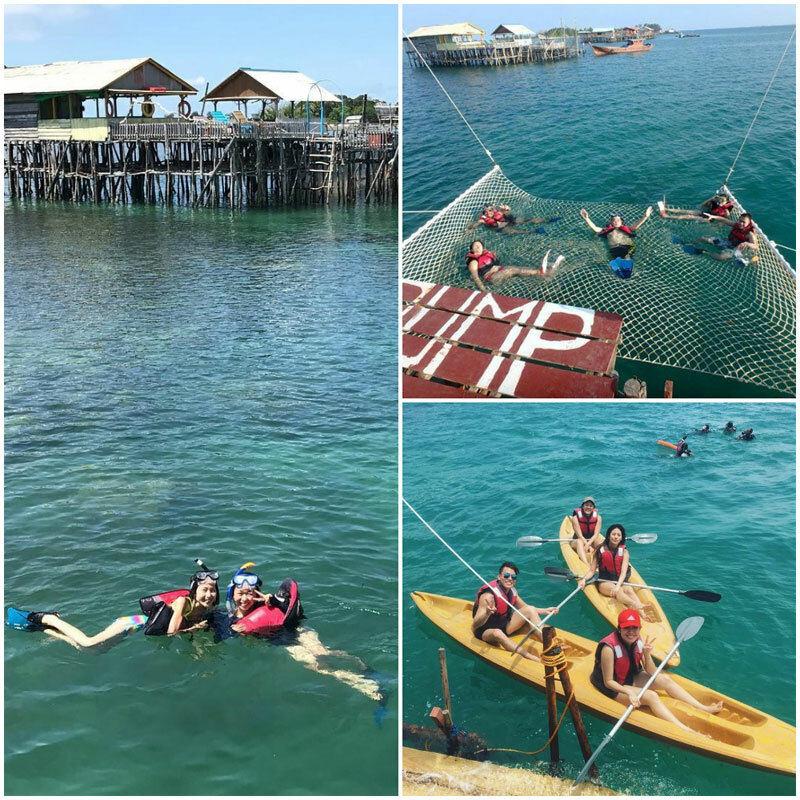 You can also take part in the activities offered at Nirwana Gardens, meaning an extensive array of watersports you can choose from, such as parasailing or the new Nirwana UnderSea Walk! Dining comes with a lovely ocean view if you head to the Neydles Restaurant for some comforting Asian cuisine. 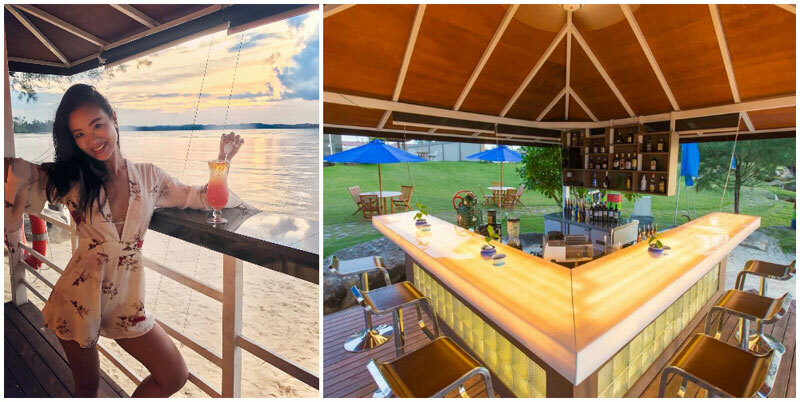 There’s even an outdoor deck right on the beach where you can hang out for some lazy afternoon cocktails. And when it’s dinnertime, you should be getting excited! How about some fresh prawns, lobsters, fish or crab? 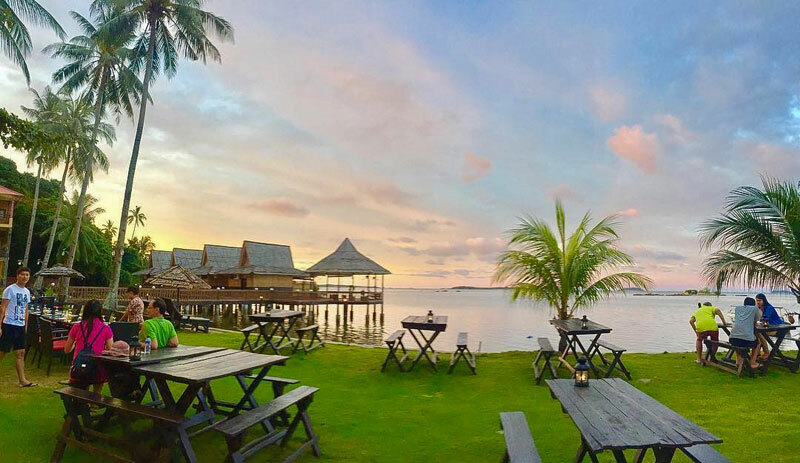 You’ll love your catch of the day at the iconic Kelong Seafood Restaurant, where you can enjoy one of the best sunsets in Bintan Resorts. The spa is also great for a fun girls’ day of pampering! 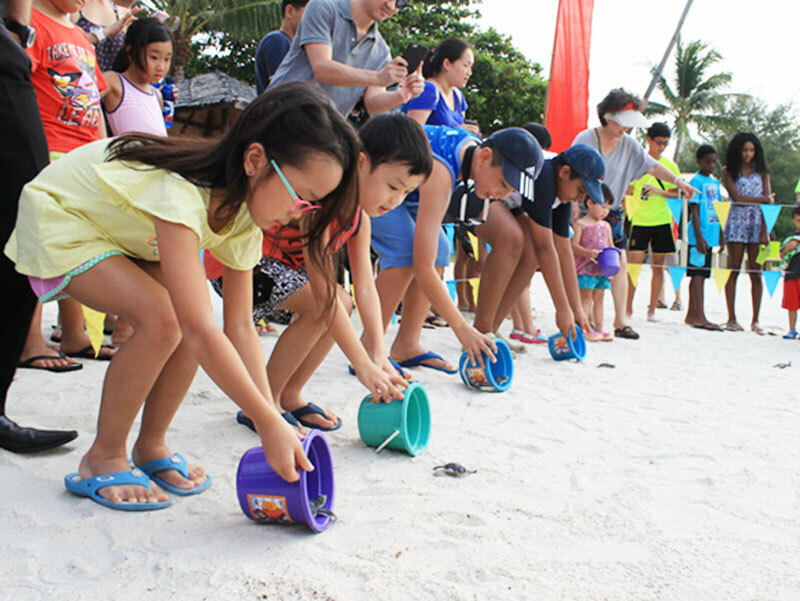 Nature enthusiasts and kids who love animals will want to keep a look out for seasonal activities such as releasing baby sea turtles back into the ocean, during which they can learn about turtle conservation. If you and your friends are looking for some adventure time, Max’s Dive Centre will get you all geared up for scuba diving. The expert instructors will train you up quickly and effectively so you can get to the fun part – underwater exploration! 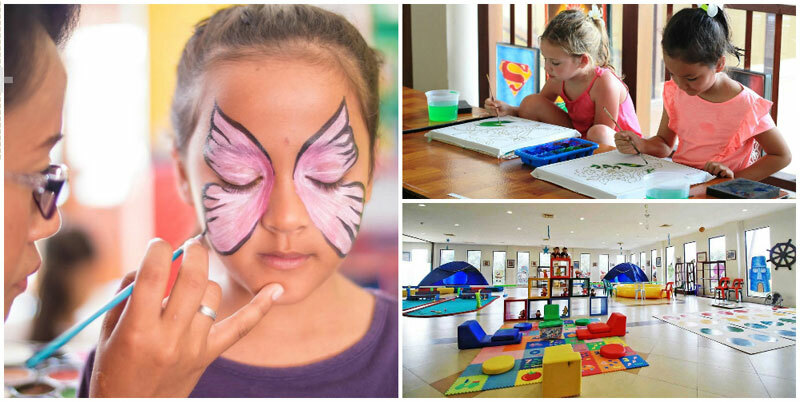 For families travelling with kiddos, don’t miss the Nablez Kids’ Club – with everything from face-painting, foam party, horse feeding to arts and crafts, this is a wonderful place for kids to let go of their creative energy and have a blast! Holidays with kids are no longer a nightmare. Nirwana Gardens has truly earned its name – a veritable nirvana, right here on earth! 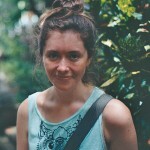 All other images by Nirwana Gardens. 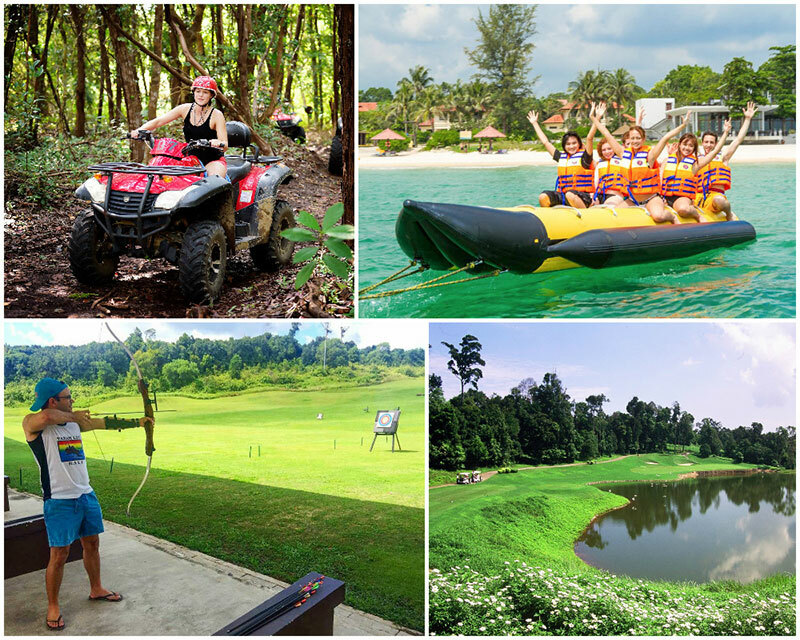 Check out more activities and facilities available at Nirwana Gardens here! 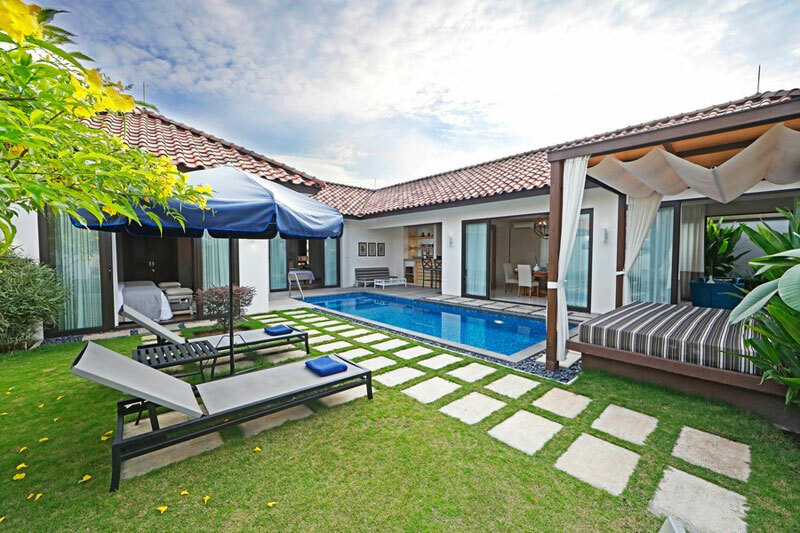 The Holiday Villa Pantai Indah exudes nothing short of absolute indulgence for all your family luxury needs. Between the private gazebo and pool located right at your doorstep, we wouldn’t blame you if you never want to leave your villa! You just need to wander a bit further from your room to spend a relaxing day at the hotel’s Anindya spa, or enjoy your royal treatment in your villa! Want to get away for the afternoon with your buddies? Why not kayak out to sea or join a mangrove tour? 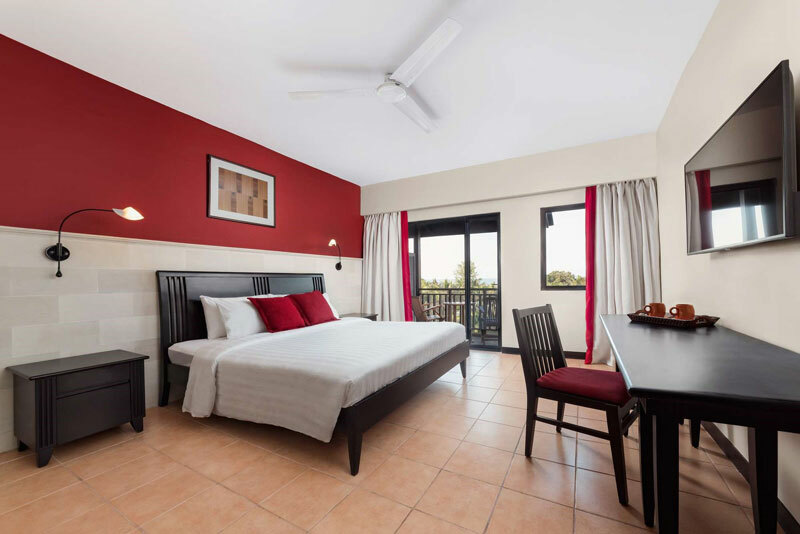 After an adrenaline-filled day, all you want is to come home to comfy spacious villas that can accommodate your family or gang (opt for the two-bedroom villa). Midnight swim in the private pool, anyone? There’s even a bar table for some late night chats over drinks! Beach lovers unite! 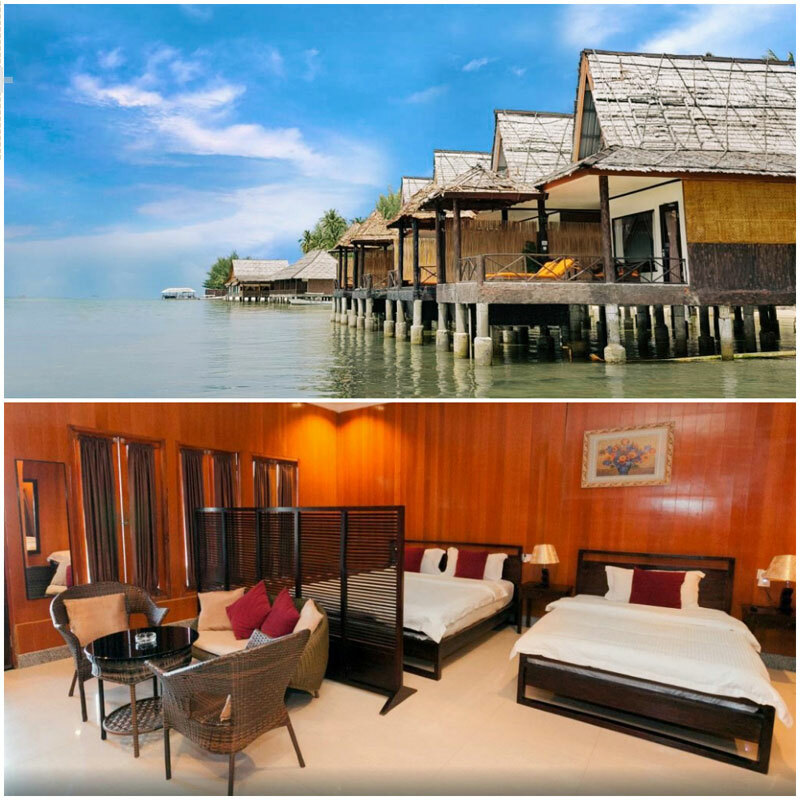 Angsana Bintan is conveniently located just steps from the shore, and will satisfy any ocean lover’s cravings of the sun, sand and sea. What’s even better is that you have exclusive private access to the beach, so privacy is guaranteed! Once you can pull yourself away from the sand or the spectacular oceanfront pool, it’s time to venture indoors. The two-bedroom Island Family Suite is a comfortable holiday nest for you to retreat to after a long day of fun. And yes, there’s an outdoor jacuzzi on the sundeck, with a lovely garden view. What can be more refreshing than a relaxing soak with your loved ones before snoozetime? When you’re fully recharged, gear up for a diverse range of activities the next day, organised by the hotel to keep you and your travel buddies happy. From a recreation centre to a marine centre with watersport options, there’s something for everyone here! Any yogis in your group? 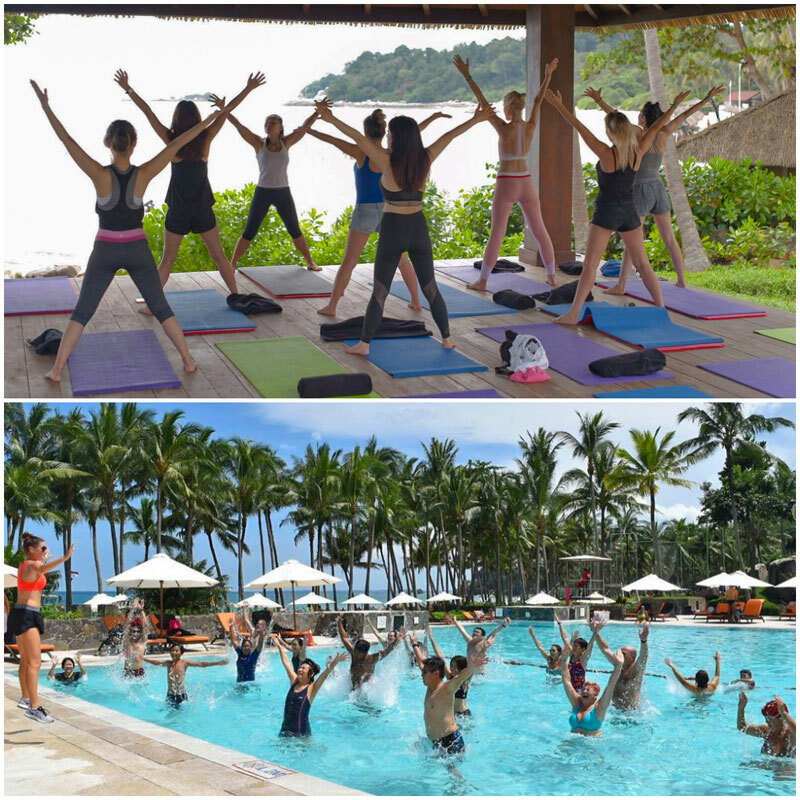 Good news – the hotel offers yoga classes! Grab a mat and find your zen – start your day off right with a little downward dog in the morning. 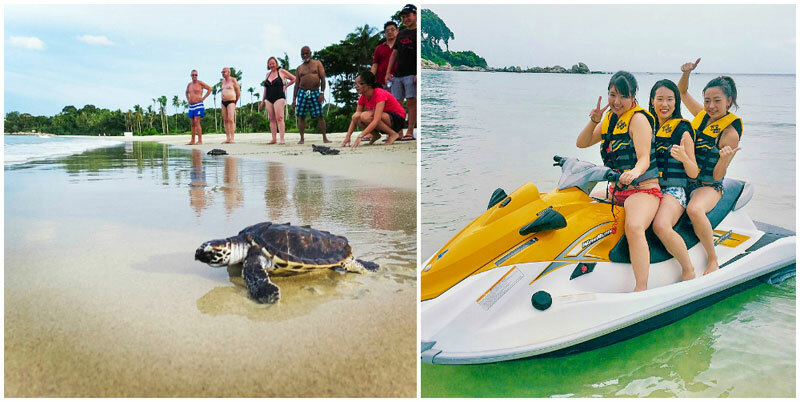 The eco conservation lab also offers a unique chance to see baby turtle hatchlings re-introduced to the sea – a meaningful memory that nature lovers will cherish for years to come. 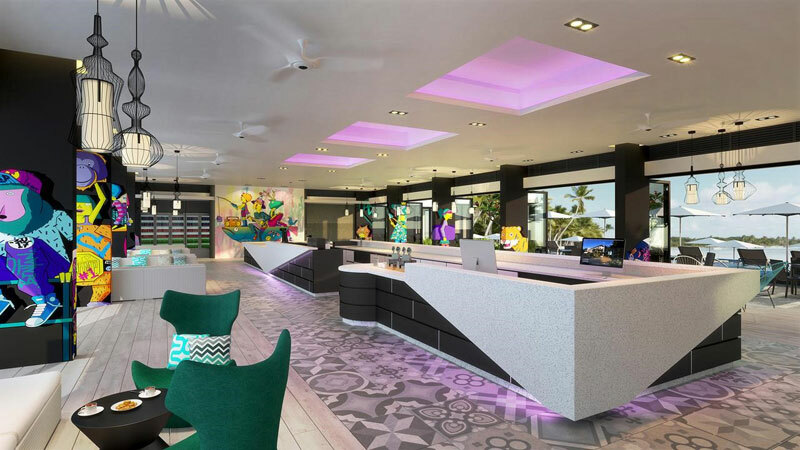 If the family is travelling together, don’t miss the kids’ club, where there’s so many fun activities such as arts and crafts to keep your little ones creatively entertained! 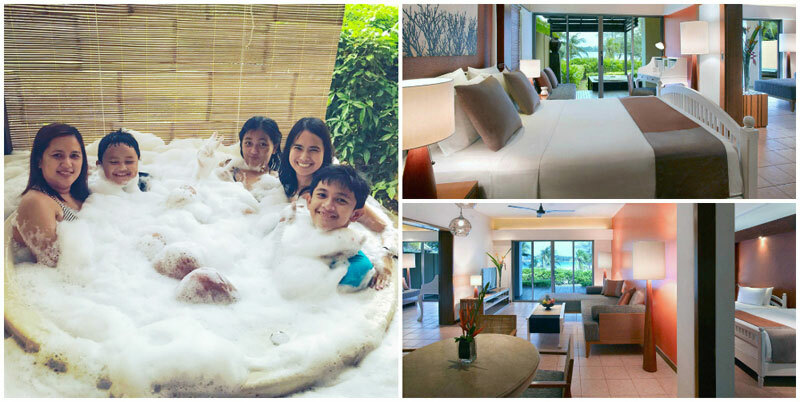 Looking for a zen paradise for your family and friends where you can escape to complete and total relaxation? 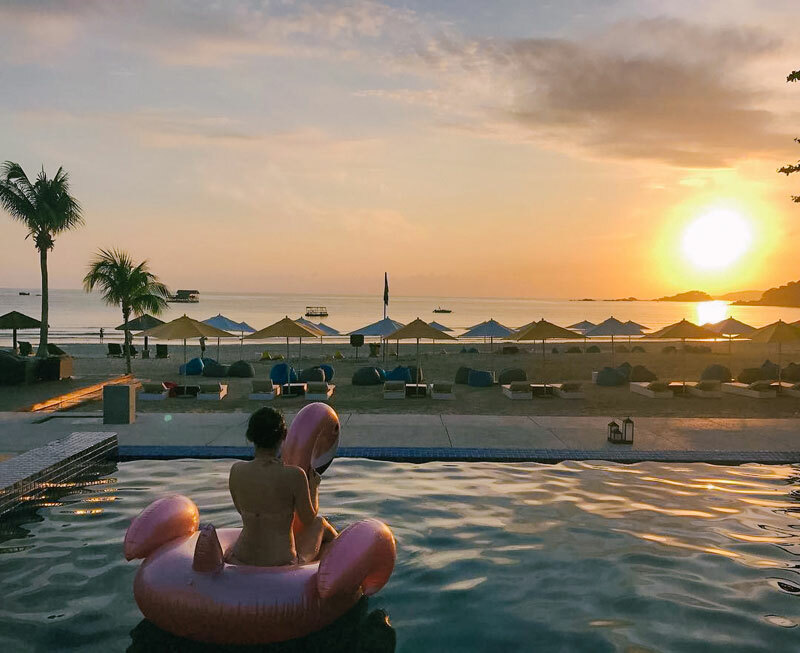 The comfortable modern design of Lagoi Bay Villas will make the villas instantly feel like home, and enjoying your own private pool sure is a wonderful way to start and end your day. After all, who doesn’t love a midnight swim just before bed, especially when the pool is only steps away from the edge of your bed? The villa is in a prime location, nestled in a central district, and yet is a quiet and serene oasis for relaxation and peace – a jewel on the island. Glamping (also known as ‘glamorous camping’) is all the hype right now and you know it. How can you miss out on the trend? 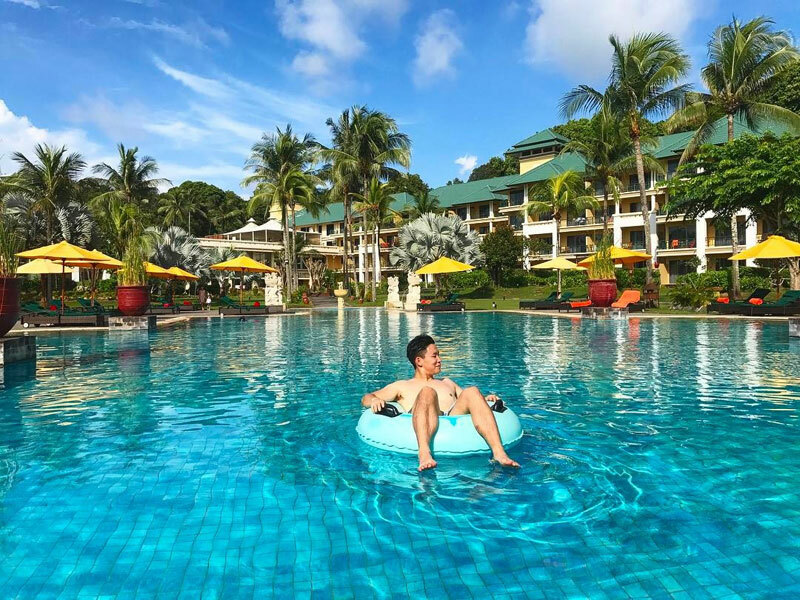 Tucked away in the lush greenery of the Bintan forest, The Canopi is a luxurious getaway for adventure seekers and camping enthusiasts who don’t want to give up on that bit of comfort. 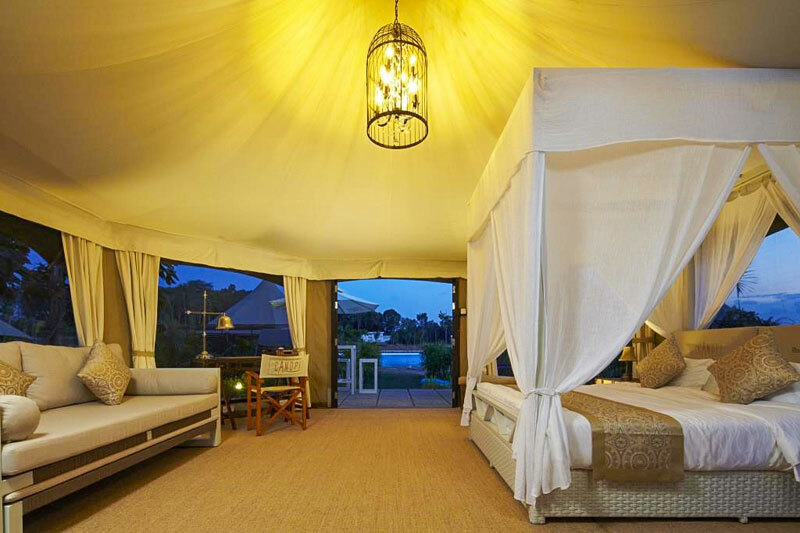 Combining the best parts of rustic adventure and luxurious glamour, you get to stay in a spacious tent that’s fully equipped with comfy beds, sofas and modern amenities. We highly recommend splurging on the Lagoon View Deluxe Tent, which comes with an outdoor whirlpool that overlooks Crystal Lagoon, a massive saltwater blue lagoon (yes we are serious!). 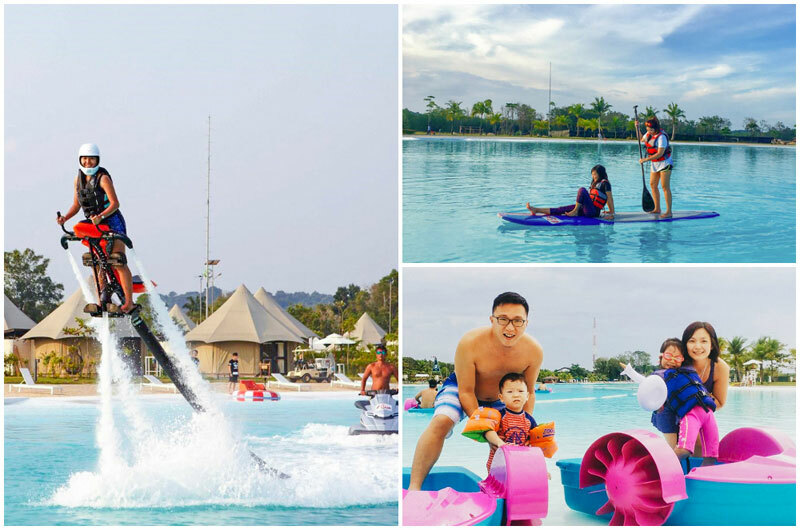 And this lagoon is actually a recreational hub where you and your family can have fun with the various interactive water activities, such as kayaking, bumper boat ride, wakeboarding and floating obstacle course. 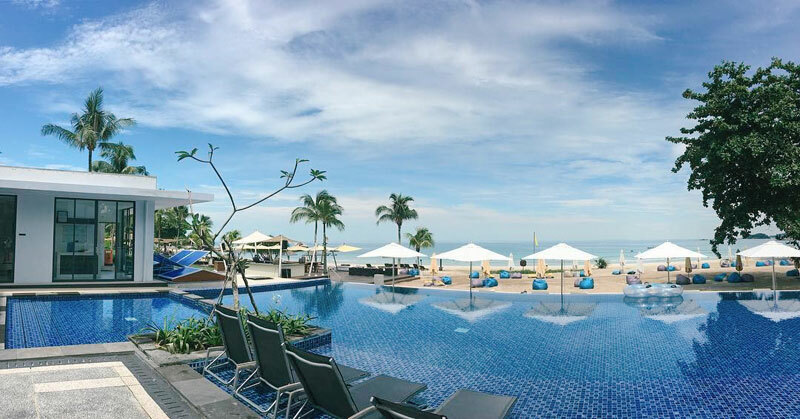 You can swim too, of course – the specially filtered seawater is delicate on your skin! Whether you’re an active family or a group of adventure-seeking pals, this is definitely the place for you! Raise your hand if you love all-inclusive full-board resorts! 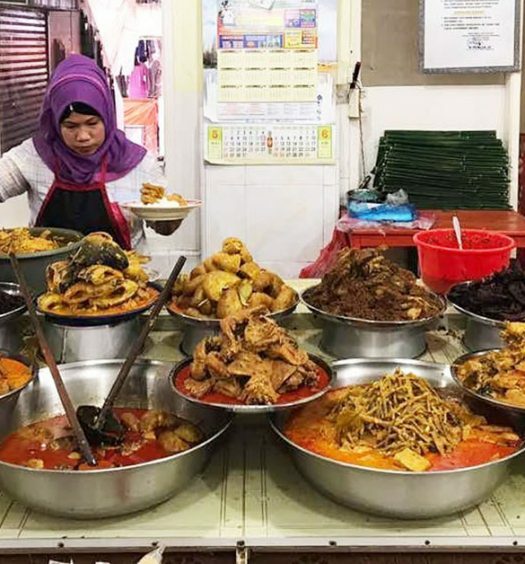 Having everything from food to drinks available right at your fingertips makes you feel especially spoiled, and that’s exactly what you’ll get (and more!) 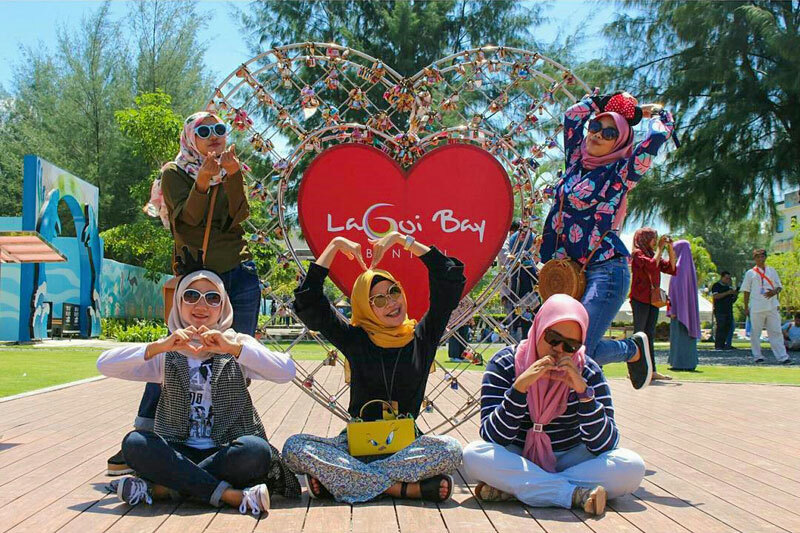 when you stay at Club Med Bintan Island. Where else can you get an instant drink refill at no charge? 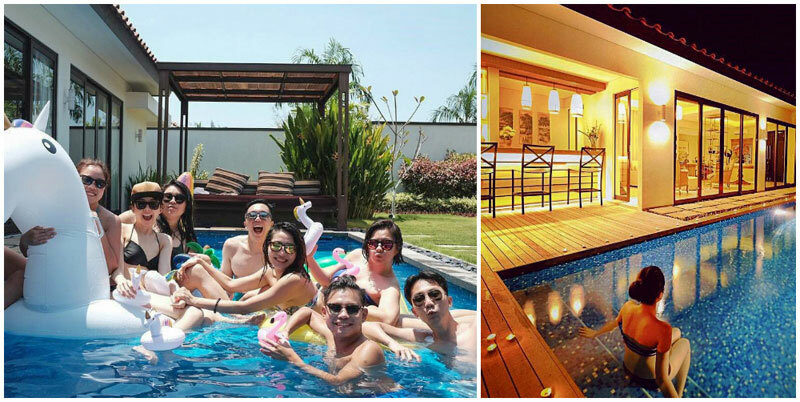 This luxurious resort will make you want to stay forever and never leave the party! And if you’re staying in a Deluxe room, you can wake up to peaceful views of the South China Sea (do remember to request for a sea-facing room). Alongside a stunning white sand beach, swaying palm trees, and a warm tropical breeze, Club Med offers all the best sports activities as well as sports schools (if you’ve ever wanted to learn archery, flying trapeze or sailing, now’s the time!). Bringing kids or teens along? Not to worry, they will be kept entertained the entire day at the children’s clubs (age-specific ones too!) 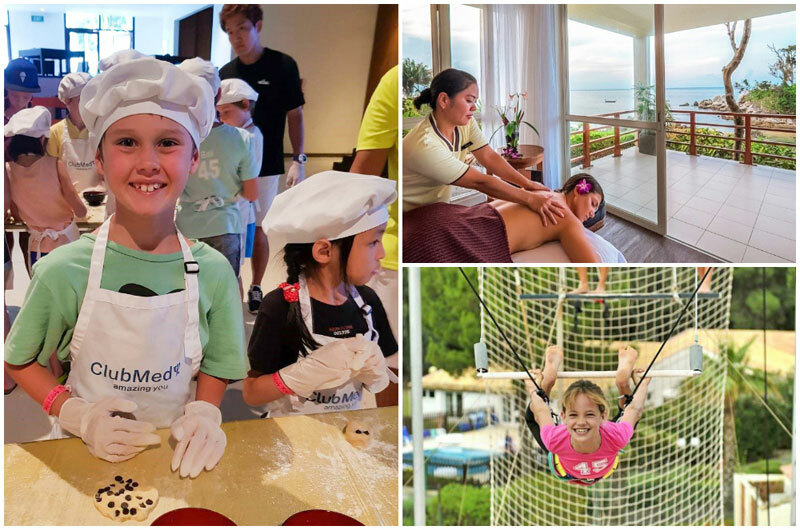 with exciting activities and special programmes such as Little Circus, Petit Chef and Teen Spa. Trust us, they will have so much fun and leave you and your spouse completely alone for some couple time! If you’re a yogi, don’t miss yoga by the beach—great start to your day! There’s also a spa if you’re into getting totally pampered – and who isn’t? With everything included, we wouldn’t blame you if you never wanted to leave! Don’t we all love convenient beach holidays? 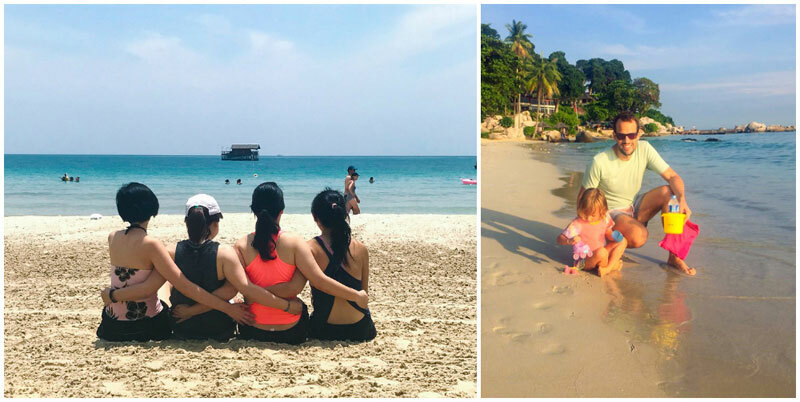 Which is your favourite resort for a family vacation or a getaway with close friends?